I chose the name “Ice Cream For Breakfast” because it’s both a metaphor and an example of the struggle of adulthood.I lost a lot of weight recently and I want to talk about how I did it, but first I want to talk about my weight and what being overweight was like. But if you want to just skip to the end and read my conclusion – the real meat of this thing – just skip to the last paragraph. Several years ago I was walking through Publix one day, I think I was on the cereal aisle – I was probably picking out something sugary – when one of my sisters called me to talk to my then-four-year-old nephew. His mom was talking to him about college and he was intrigued at the thought of living someplace without any “mommies or daddies.” So she called her little brother who was only a few years out of college to talk to him. He excitedly asked me if it was possible to eat pop-tarts and Doritos whenever you wanted. I laughed and confirmed this for him. I grew up in a home where we didn’t often have pop-tarts or Doritos – at least not the real, full-fat kind. If we ever had anything it was probably both the generic brand and the low-fat version my dad was looking to save money and mom was looking to save calories – both, by the way, are good traits and somehow, I survived. 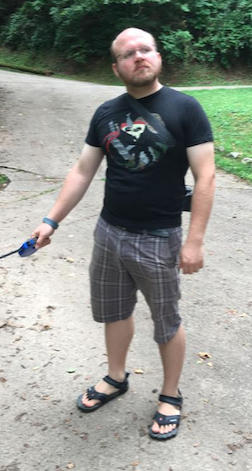 I did get enough of that concern for calories instilled in me to be concerned when I saw a picture of myself after my junior year of college, which caused me to work to lose 20 pounds over the summer. Losing weight as a 21 year old is easy. You eat salad for one meal instead of a burger and fries and go jogging a couple of times a week and you’re good. This tactic doesn’t work once you get past 27. Last fall I was at my heaviest – at 237, I wasn’t absurdly over weight by most standards, but I’m only 5’7″ so that puts me in the “obese” category easily. By the way, the word “obese” often gets used when people mean “morbidly obese.” I once referred to myself as obese and was chastised for being self-deprecating. I then explained that I wasn’t being figurative, that I knew what my BMI was and I was actually well into the “Obese” range for my height. The person, who thought they were being kind, then argued that those scales don’t take body type into account. She’s right; they don’t – but considering I was more than 30 pounds into the “obese” category – I knew that the categorization was accurate. Something had to change. I didn’t have any discipline in my life as of last fall. For no good reason I’d fallen out of lots of habits of personal maintenance in most areas of my life and I felt it. The weight was one small part – it just happened to be obvious to everyone around me. In the past six months I’ve lost almost 40 pounds. And I feel . . . a bit better. I won’t lie I’m happier with my appearance, but when skinny people ask me “but how do you FEEL?” They say it like they expect me to say “Well, most of my life’s problems are solved and now I can’t be harmed by conventional weapons.” I don’t feel any more energetic, my mood hasn’t altered – I’m actually more apt to be cranky because I’m hungrier most of the time and I’m more aware of how I was dealt a bad hand with my metabolism in comparison to some of the people around me. At the same time I’ve learned more about the amount of calories that are in the foods I’m eating – which has changed my eating habits. And my body has adjusted to eating fewer calories. But to me it’s more about the discipline. Being a little overweight isn’t a huge deal to me, but to some people it’s a big indicator of your whole life – people might even subconsciously extrapolate that an apparent lack of discipline in your diet means you have no discipline anywhere. They might think that if you’re over weight then you likely have no discipline, no self control, or you’re just plain lazy. In my case they’d basically be right, but still, these are superficial assumptions. Regardless, to some people fitness is next to godliness. Don’t be that guy. Don’t tell people they need to lose weight. Overweight people KNOW they’re overweight. They feel it with every step. They see it every time they look in the mirror. 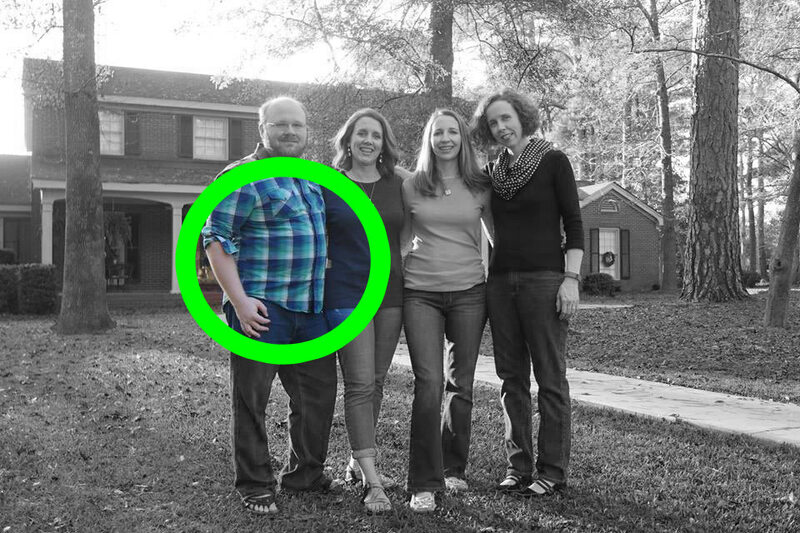 Being overweight is it’s own punishment – no need to be mean to these people. BUT if you’re a Christian, then weight is a bigger issue than something superficial. And I’m not just talking about the sin of gluttony, though that is definitely an issue that the western church doesn’t address often enough. I’m also talking about the fact that your body is a temple. Yes, it’s Christian a cliche, but it’s also scriptural. Even if you have moments where you don’t respect yourself enough to put the ice cream back in the freezer and have kale and eggs for breakfast instead, you need to start with at least enough respect for your savior to want to keep his temple in some kind of shape. Not out of guilt, but out of love for him. Not out of shame for your appearance, but out of a desire to be a good witness. Remember what happened last time Jesus showed up to a temple and didn’t like what he found? He went first century on their tails. 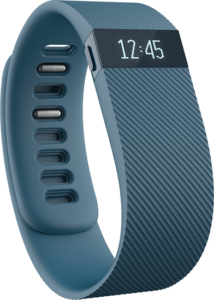 In February of this year I bought a refurbished fitbit from Groupon goods. I then started finding time in my day to get in steps, climb stairs, and to just stay active. I found meals that I enjoyed that were reasonably low-calorie and when I knew I wanted to have a bigger meal I’d budget my day around it. Since my small group fasts on Mondays anyway, I don’t have to worry as much about the calorie in take that day. I started having sautéed kale, scrambled eggs and coffee every morning. I keep grilled chicken strips in my freezer all the time and throw them on a salad with a light dressing for a low calorie meal at home. Or I make my own chili. I still eat everything that I love, just a little less often and in smaller portions. I certainly don’t force myself to eat foods I hate. I once had a doctor ask me about my diet – I thought he was going to get onto me and say I needed to lose weight. Instead he proceeded to say that I shouldn’t be on any of those “weird diets” that cut out whole categories of food. I say this to say that shock diets may help you lose weight, but most doctors don’t endorse them because they’re not healthy for your body in the long-term. There was never any danger of me trying one of these. 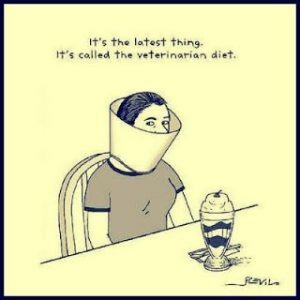 The issue with most popular diets for me is that they’re more about what you can’t eat than what you can. I would hear about someone losing lots of weight on the slow-carb diet and think “well I’d never be able to do that.” and just say that I guess I can’t lose weight. Or I’d have a friend hang out with me and I’d fix dinner – he’d then tell me that he couldn’t have normal human food because he’s on the (fill-in-the-blank) diet. This bothered me as a good, southern boy, who was taught that it is rude to turn down food you’re not allergic to, so it further turned me off to fad diets. I actually haven’t cut much out of my diet entirely, partially because I had a pretty nutritious diet – I was just eating too much. I’ve always avoided foods with lots of preservatives and other chemicals that make food harder to digest. I do avoid foods sweetened with high fructose corn syrup as studies indicate that it increases cravings and may contribute to several diseases. I’ve found that removing HFCS has helped curb my cravings for sweet foods. I keep apples around and just decide to eat those any time I’m hungry. I stayed active on a daily basis; this was the biggest change. My goal is 12,000 steps per day. When I started my diet I was very strict about getting it every day. Now, six months in, if I have a day where I don’t get it once or twice a week I don’t worry too much as long as I’m careful with my calories. I work in a large building, so 1-2 times a day I take 10-15 minutes and get up and walk around the building. I’ll also take 10-15 minutes around lunch to run the stairs in our worship center; I do enough to get 25 floors. When I get home I’ll walk my dog. Between all this it’s easy to get in 12-20,000 steps in a day. Obviously, I don’t have time to do this every day, but if I can make time to at least run the stairs and walk Zeus when I get home – that usually does the trick. I found it was less about getting “cardio” every day and more about just staying active – getting up and dancing alone in my office is not out of the question. One of the unexpected things was I found myself being more productive; even though I was taking time out of my day to walk or run stairs, the rest of the time I was more motivated, and because I took some time away to think about ideas I found my head was clearer. Anyone can lose weight – If I can do it, you can do it. I’m not an athlete and I love sugar more than anyone I know. If I can learn to curb my cravings, and can add a little more activity to my day, then you can do it. If this is a spiritual struggle, I’ll add that you and the Holy Spirit can do it, even if you can’t. I know I’m not a parent, nor am I married – but if you’re not healthy, you’re not doing your family any favors. If your job is keeping you from being healthy, you need to be working toward getting out of that situation. Nothing is worth your own health – not your job, your friends, you family, or bae – especially not bae. You don’t have to be a jerk to be healthy – Honestly one of the things that made me not want to work on my own health was the people I met who talked about their diet or exercise plan. Either they complained about their weird diet or they turned down the perfectly healthy food I’d made for them. For people who really struggle with their weight, you might have to be more regimented at first, but once you get in the swing of things you should be able to function normally without complaining about/criticizing the food you’re offered at a friends house. And you shouldn’t be eyeing your friend’s plate at a restaurant, either judgmentally, or because you can’t stop complaining about what you’re having to eat because of your diet. But you will have to make sacrifices – If you want to have a doughnut, you can have a doughnut, but you might not get to have much of anything else if you want to have a calorie deficit for the day. The first few weeks were the hardest for me, but they were also the ones wherein I lost the most weight. You may have to be a little hungry some times until your body gets used to fewer calories. At first you may only get one meal a day where you really love what you’re eating. You may not get to eat everything you love every time you want to. If it’s easy, you’re not doing it right, but it gets easier. It’s not fat shaming – I believed this before, but I feel I need to say it now more than ever. People who are overweight need to lose weight. I still need to lose weight. There’s been a recent movement against encouraging weight-loss that claims you can be “healthy at every size.” This is a lie. While you can be healthy with any body type, and you certainly don’t have to be rail-thin to be healthy, being overweight puts you at risk for tons of diseases and puts pressure on all your various body-systems. You don’t have to tell everyone they need to lose weight, but you’re not doing anyone any favors by telling them they’re perfect.If a friend says they need to lose weight you don’t have to say “HECK YES YOU DO.” But you don’t have to say “no! you look great.” You could invite them to go walking with you a few times a week, or suggest some healthy meals. 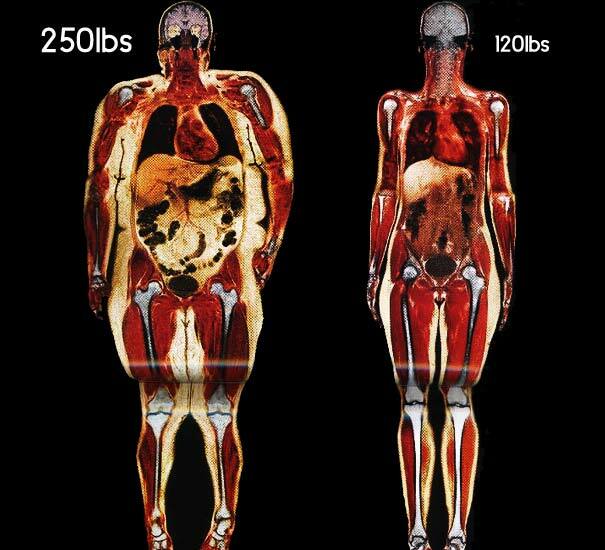 I saw this image of two different women’s MRI and it showed me the severity of things – look at the fat around the organs, imagine what that does to a person’s body. You know when you’re healthy – If you’re honest with yourself, you know when you need to lose weight. You also know what weight is the happiest medium for your lifestyle, confidence, and physical health. You might not be “perfect,” but you’re healthy and that’s more important. Don’t get overly obsessed with hitting a “target weight.” It’s good to have goals, but your main goal should be to be healthy and find something manageable. Being just a little more fit gives you more credibility – We’re superficial people, and when I was over weight I knew it made no sense for me to be talking about discipline, scriptural truths, or advice on how to order other people’s lives, when I so clearly didn’t have my own personal life under control. Who am I to talk about sin when it appears that I give in to gluttony constantly? Its on going – it never really ends, I currently am almost 40 lbs down from where I was six months ago, but I’d love to lose ten more pounds. At this point, though I feel pretty good and I think I’ve found a balance that works for me. It’s a constant climb, but it’s well worth it. As I said in the blog entry last week, there are no after photos in the christian walk. And really that’s the case in all life-long pursuits; it may get easier, but you don’t reach a point where you’re totally done. That may be discouraging to some, but when you realize that the alternative is to deal with heart disease, diabetes, joint pain, low energy, and numerous other health risks – you begin to realize that you’re choosing between applying some will power on a daily basis or shortening your life and being uncomfortable in your own skin. So the bottom line is that adulthood is about taking responsibility for yourself and being disciplined. Kids don’t have to think about their diet- they have a mom that’s keeping them from over-sugaring themselves. Children don’t have the authority or ability to control their own diet. When you as an adult don’t choose to take care of yourself, you’re essentially saying to yourself that you don’t have the ability to control your own diet, even though you have the authority. Regardless of your age, embracing the best for your adulthood is taking control of the things in your life that you can control and – unless you’re in prison – you can control what you put into your body. As with all acts of discipline it just starts with deciding to do it, and then having faith that the Holy Spirit is going to be available to help you with the follow through.